Today’s advances in science provide some insights into tomorrow’s science and implications for litigation. Consider, for example, the possible implications of a “gut monitoring” pill that can be swallowed and will then send out wireless data regarding conditions encountered. As of today, the pill picture above is a real world example of such a pill. It is undergoing testing in pigs. So far, it seems to work, but this proof of principle reports only on the presence or absence of blood. At present, researchers are working to reduce the size by 2/3 and to reduce the amount of power needed to function. 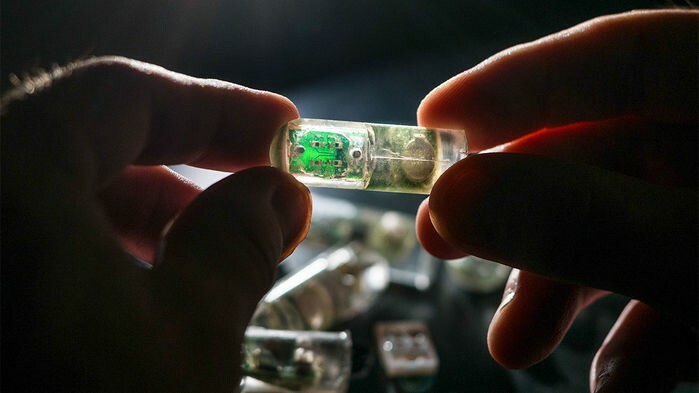 For more information on this technology, see this excellent article by Elizabeth Pennisi: Bacteria in a pill may one day track your body’s chemistry. ← What is the Difference Between Predisposition and Susceptibility in a Genetic Defense?